Researchers who need to track eye movement will have two new solutions to handle that part of their projects. Tobii Pro, a company that caters to academic and business users who need screen-based and wearable eye trackers, is introducing two new products — Tobii Pro Spectrum and Tobii Pro Lab. Both measure the physical dimensions of the individual's eyes and maintain tracking quality even when the subject moves his or her head or the pupil size changes. The announcement is expected during Neuroscience 2016, a conference taking place this weekend in in San Diego. The first offering is a kit with both hardware and software. It's intended for researchers who need an especially high sampling rate or want to allow their study subjects to make larger head movements. 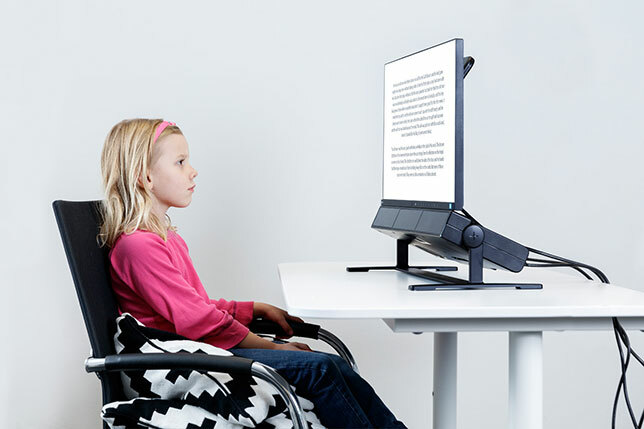 Sampling with Tobii Pro Spectrum can capture eye movements such as saccades, correction saccades, fixations and pupil size changes, at an adjustable rate between 60 Hz and 600 Hz, depending on the needs of the research project. Data can be collected through two eye-tracking cameras, each capturing up to 600 images per second on both eyes. (Previous products had a "gaze sampling frequency" of up to 300 Hz.) A removable 24-inch screen allows for both real-world or on-screen stimuli. The ability of the system to tolerate larger head movements makes it more useful, the company said, for research that involves children or people with short attention spans. Tobii Pro Lab is a software-only application that can be combined with other biometric sensors monitoring brain or heart activity (EEGs or ECGs, respectively) or sweat production (GSRs). The software works with screen-based or wearable eye trackers. A software development kit included with this release enables users to build custom applications that incorporate screen-based eye trackers. "It is essential that eye trackers can accommodate head movement while providing high-level eye tracking capacity to enable tasks that better reflect real-world scenarios," said Adam Guastella, a researcher and clinical psychologist at the University of Sydney, in a prepared statement. He noted that the systems from Tobii will help "users with all levels of experience to develop and use sophisticated eye tracking experiments to understand mental processes, emotions and behavioral responses that may be beyond conscious awareness."